I discovered frittatas last year when I started my low carb diet. I’ve tried a variety including Pancetta & Onion Frittata, Broccoli Frittata, Turkey Bacon Frittata, Caramelized Onion, Red Pepper & Zucchini Frittata and even Steak Frittata! You can pretty much be as creative as you like. It’s such an easy dish to make. This Bacon & Gouda Frittata was inspired by the Bacon & Gouda Quiche in the May 2013 issue of Canadian Living. I didn’t want the crust since I’m watching my carbs and figured it would turn out just as good as a frittata. I was right! It’s a more sophisticated flavour than my standard bacon and onion frittata with the addition of thyme, garlic and the chives. Overall, it’s a keeper and one that is going in my recipe vault! 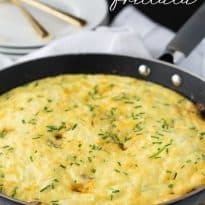 Perfect for a low carb brunch! In a large bowl, whisk eggs, Gouda cheese and chives and set aside. In a large skillet, cook bacon over medium-high heat. After about 4 minutes add in the garlic, shallots, red pepper, thyme and salt and pepper. Cook for another 10 minutes or until shallots are softened and bacon is cooked. Yum! This would be excellent for dinner tonight, lovely and light! Thanks! wow I think I just found my favourite new recipe!! I love trying new recipes and this seems similar to Quiche Exocet quicker. Can’t wait to try it. oops I mean I love gouda cheese and this looks yummy! absolutely would love to try this! i have to try this out. That looks pretty good.I love dishes like this and was wondering if it’s like quiche or is it entirely different.I will probably try it to find out. A great recipe and who doesn’t like bacon?! Bet it is super flavourful. I like the inclusion of the gouda, spices and seasoning. 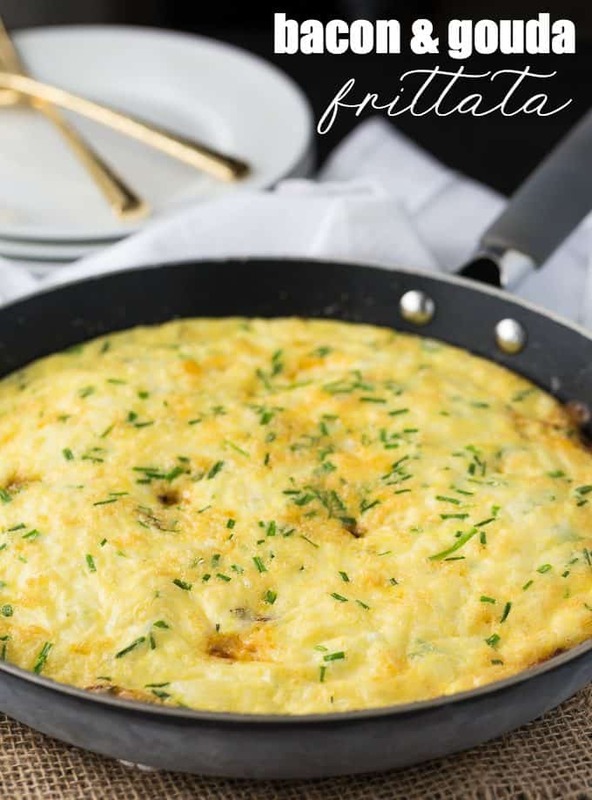 It probably changes the taste significantly enough to add variety to the traditional frittata. I’ll check out all the other kinds you’ve tried and take some inspiration! Thanks! I like these kind of meals – easy to make and they are delicious with a side salad nice and light for the summer time meal. Thanks for the recipe. This looks so delicious. I will make this!!!!!! This looks delicious! 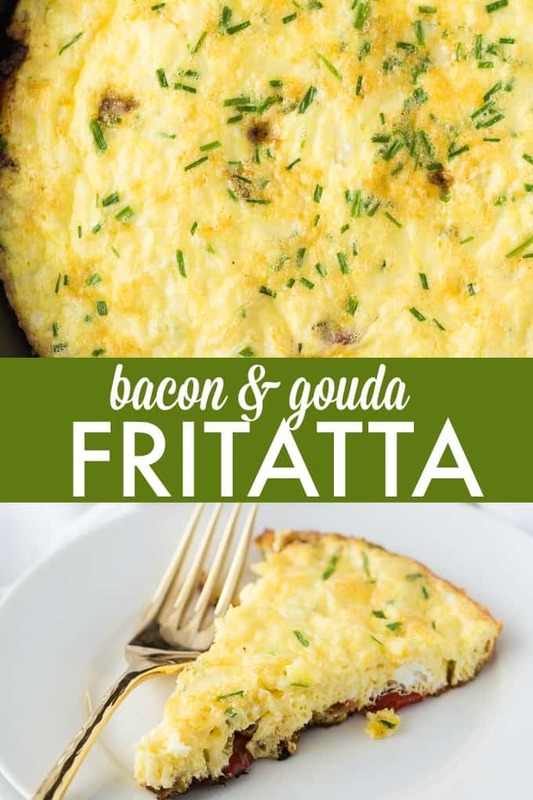 I’ve never used gouda in a frittata before, I bet it’s wonderful! Ever try making a frittata with Smoked Gouda? Eggs, cheese and bacon – a fancy omelette – looks delish! I pinned. WOW! That looks so incredible! Thank you for sharing the recipe. We have had this a few times and everyone loves this !! I’m hosting Mother’s Day brunch this year and am pinning this to make!!! You had me at bacon. Thank you! This sounds delicious! I can’t wait to give it a try this weekend! Yum! Gouda is one of my favorite cheeses and bacon is a no brainer for yumminess. Thanks for sharing your recipe on Merry Monday. Pinned.